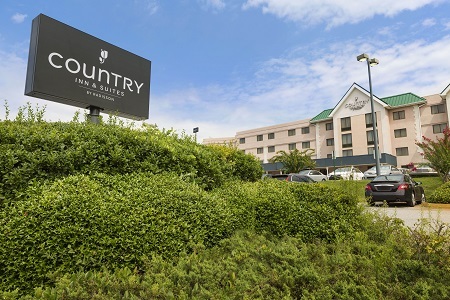 Located less than three miles from Hartsfield-Jackson Atlanta International Airport (ATL), the Country Inn & Suites® by Radisson, Atlanta Airport South, GA provides an ideal home base for business and leisure guests visiting the area. 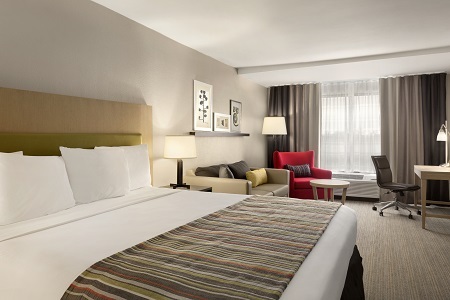 Our hotel’s convenient location, only 12 miles from the bustle of downtown, provides easy access to popular Atlanta attractions like World of Coca-Cola and the Georgia Aquarium. Kids love getting up close to the giant pandas at Zoo Atlanta, and corporate travelers can enjoy some fresh air at Browns Mill Golf Course after a day of meetings. Business guests can also attend a conference or seminar at the Georgia International Convention Center, only 10 minutes from the hotel. When you need additional space to spread out, reserve one of our Studio Suites and enjoy a king bed plus a living area with a sleeper sofa. 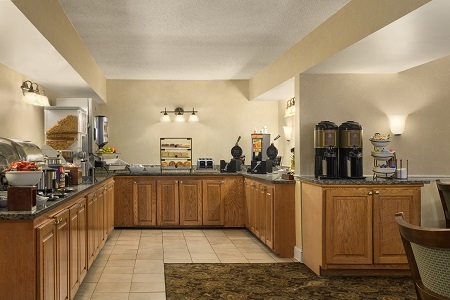 Our free, hot breakfast offers a tempting selection of morning favorites like bagels, coffee, muffins and fresh fruit. If you’re in a hurry, take a cup of coffee and a pastry to go. For lunch and dinner, you can order delicious American and Korean dishes on site at Genesis Bar & Grill. If you’re interested in off-site dining, visit nearby restaurants like Cafe at the Corner, which serves up classic French eats like quiche, crêpes and chocolate éclairs. Georgia International Convention Center – The second-largest convention center in the state, the GICC hosts conferences and trade shows throughout the year. 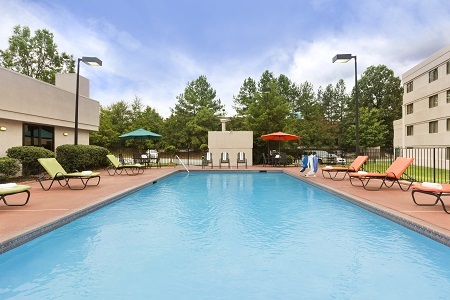 It lies less than four miles from the hotel and is easily accessible from the airport. Fox Theatre – Drive 31 minutes to catch a live performance at this spectacular theater that features stunning Moorish architecture and decoration. The auditorium ceiling is studded with 96 crystal stars to imitate the night sky. World of Coca-Cola – Travel just over 14 miles to this interactive museum to learn about Coca-Cola manufacturing and get a peek at the secret recipe. Finish your tour by sampling dozens of soda flavors from around the world. Hosting a social event or corporate gathering in Atlanta? 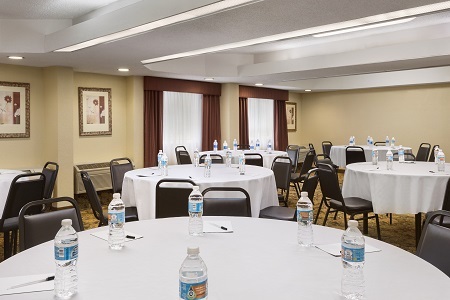 The Country Inn & Suites provides two flexible meeting rooms perfect for your upcoming affair. The smaller space is ideal for intimate boardroom meetings, while the larger room can accommodate up to 50 guests. Take advantage of audiovisual equipment and free Wi-Fi to present slideshows and stream videos with ease. Our airport shuttle runs on a loop to and from the domestic terminal 24 hours a day. From the international terminal, exit the terminal and ride the Domestic Terminal Shuttle to the domestic terminal. Follow signs for area hotel airport shuttles. Go across the street to the hotel shuttle area (purple signs). The shuttle arrives for pick-up at 15 minutes and 45 minutes past the hour, every hour. Please make sure to get on the Country Inn & Suites shuttle bus going south.